If you are a keen wildlife watcher or photographer looking for a piece of kit to help you understand your wildlife subject and plan your next photographic masterpiece then a Pulsar Quantum HSQ19 would make a very useful addition to your kit bag. As an ecology or conservation organisation I can see huge benefits of having a thermal imager like the HSQ19 at your disposal. Reducing man hours required for particular monitoring projects, reduction in potential health and safety risks and costs, providing invaluable insights for research and potential PR opportunities I’m sure the HSQ19 would justify its price tag in next to no time. 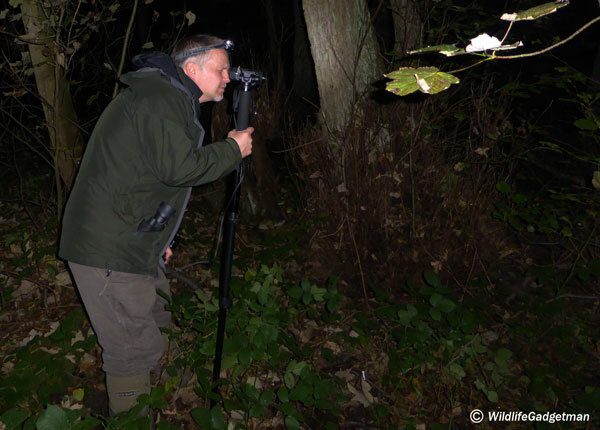 I’ve built up a huge amount of knowledge and experience over the past ten years designing and developing wildlife camera systems using infrared lighting but until very recently had little or no experience using Thermal Imaging. Earlier this month I was thrilled to be asked by the guys at Scott Country to take a look at the Pulsar Quantum HSQ19 Thermal Imager. With a retail price of over £2k it’s not going to be on everyone’s shopping list but I was interested to see how easy it would be to justify the investment. What’s the difference between Thermal Imaging and Infrared Night Vision? I’ll cover this question in more detail in a separate ‘How To’ guide but in short thermal imaging and infrared night vision work very differently. Both have pros and cons depending on when and where you use them. Thermal Imaging Cameras – Strictly speaking these are not cameras , but rather sensors that detect heat (sometimes referred to as thermal energy or infrared). The sensors are highly sensitive and can detect minute differences in temperature. They represent those differences as an image on a screen. Because they detect radiation, thermal imagers do not require any visible light to produce an image and can be used night or day. Thermal imagers can also be used in a diverse range of weather conditions including mist and fog. Infrared Night Vision – Unlike thermal imaging cameras infrared night vision cameras require at least a little amount of light to generate an image. The camera gathers as much light as it can through the front lens and focuses it on the image intensifier inside. This then amplifies the signal and projects the image to the eyepiece. 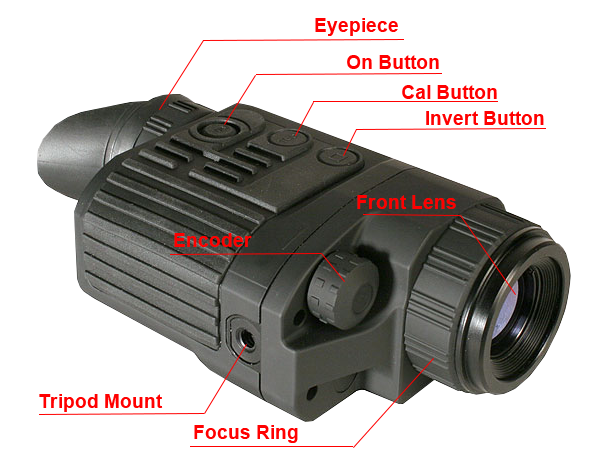 The vast majority of infrared night vision cameras are manufactured with an infrared illuminator built in. This acts light a flashlight for night vision but is invisible to the human eye. Night vision cameras use any available low level visible light and infrared wavelengths from the near visible light end of the spectrum. Infrared night vision cameras should only be used in very low light level conditions or at night as the image intensifier can potentially be damaged if exposed to extremely bright light. When I first slipped the HSQ19 out of its protective carry pouch I was surprised how compact and lightweight it was! It easily fits into the palm of your hand and feels well balanced. The body is made of a fibreglass reinforced plastic and is designed to effectively withstand impact, moisture and dust allowing it to be used in extreme conditions. However, I won’t be taking things quite that far for this review! A final layer of rubber armouring will ensure a secure grip in most conditions. You’ll find a battery compartment beside the eyepiece. It contains a removeable cradle in which you fit the four AA batteries. I found the connections on the cradle a little strange. Pay close attention to the ‘+’ and ‘-‘ markings moulded into the plastic as the connectors in the cradle do not follow usual convention. On the cradle I was using at least one of the positive terminals was a spring. I’ve never seen this before. In every other battery powered device I have ever used spring terminals are always used for the negative end of the battery. A minor point but one to look out for. The HSQ19 is very easy to use. The control buttons are ergonomically placed making it a joy to use. After a quick scan of the supplied user guide I was ready to venture outside into the garden! Eyepiece – The eyepiece has diopter adjustment and is easy on the eye. The 0.31″ OLED display is bright and clear and contains a small amount of info along its bottom edge (time, invert mode). On Button – The on button is slightly offset from the other buttons making it easy to find in the dark. Press it and the HSQ19 springs into life in approx. ten seconds. Cal Button – You’ll use the Calibration button a lot. After you first switch on make sure the lens cap is fitted over the front lens. Keep your hands away from the front of the lens and press the CAL button. You’ll see the word ‘Calibration’ appear on the screen as the camera calibrates the output of the microbolometer. This only takes a couple of seconds. Remove the lens cap and you’ll see that the image on screen has much improved definition. As you continue using the HSQ19 you’ll probably need to press the CAL button every few minutes or so to ensure the images you are viewing are as clear as possible. Invert Button – This button inverts the image. You have the option of either ‘White Hot’ or ‘Black Hot’ modes. For the vast majority of this review I used it in ‘White Hot’ mode (you’ll see what I mean when you watch the video!). Front Lens – Not much to say about this. Its a lens…and its at the front. Oh, and it offers a x2 magnification of the image. Focus Ring – The rubberised focus ring offers precise adjustment. Encoder Dial/Button – The encoder dial/button is used to adjust the brightness of the image and (by pressing) setting the time. Tripod Mount – There are in fact two tripod mounts on opposite sides of the unit. This gives you the opportunity to mount the device on a tripod AND fit an accessory. The HSQ19 is equipped with an analog video output that enables you to connect it to an external recording device or a larger display screen. The HSQ19 was a joy to use. Compact, lightweight and straightforward controls means you’ll be ready to venture out on your first thermal imaging expedition in no time. In total I spent five very late, but very enjoyable, evenings putting the HSQ19 through its paces. I used it in the garden, in Rendlesham Forest and I walked my usual local woodland route for the very first time at night. Using the HSQ19 hand held is perfectly fine in most situations but I wanted to record some footage to share with you in this review so I also used it mounted on a tripod for my visit to Rendlesham Forest. After a couple of hours walking around with my tripod I found it a bit bulky and awkward to maneuver stealthily. For my trips around my local woodland patch I used a Manfrotto monopod and found it to be a perfect combination. I’ve condensed the footage I recorded into a selection of clips that, in the short time I had the HSQ19, demonstrates its potential. Here’s a quick overview of the clips you’ll find in the video with some brief additional notes. As the clip pans around the garden you’ll see how various materials radiate different amounts of heat. I was particularly interested to see my house glowing in the background. The outside of the house is totally rendered but you can clearly see the joints (0:28) between the blockwork behind the rendering glowing. As the camera pans to the left you’ll see my ‘Gadget Lab’ with two bright spots on it. These are two high power IR illuminators for my wildlife cameras. I was intrigued to see just how much warmth is generated in and around log piles and rock piles. This demonstrates one of the key benefits of providing log piles and rock piles for wildlife in your garden. As the camera continues to pan you’ll see a plastic tub glowing brightly. It’s filled with pebbles and rainwater at the moment. It’s obviously retaining an amount of heat by the look of it! You’ll also see three old butler sinks glowing brightly too. I knew we had an active ground wasp nest in the garden and I was interested to see if the nest generated much heat. I was blown away by how much heat these little guys give off. The individual wasps glow brightly as they fly around the entrance to the nest. As the camera pans you can clearly see a glowing area towards the upper left which I assume is the actual nesting chamber. Fab! During one of the woodland walks I spotted a brightly glowing patch on a trunk from about 20m away. Upon closer inspection I found a roosting bird tucked into a small crevice. The HSQ19 clearly picked up roosting birds in trees at 200m. I also picked up a barn owl hunting over a distant field. The distance was around 400-450m so right on the limits. The recording didn’t seem to pick up as much detail as I could make out at the time so I didn’t bother including the clip in the final video. This Robin was clearly visible with the HSQ19 roosting close to the woodland path. As I approached it flew off. I could still see a heat source and upon closer inspection I found a dollop of fresh bird poo which the robin left behind. One of the key things I was very keen to test was whether the HSQ19 could pick up the heat generated by a bird roosting in a nest box. Walking around the local woodland I had the opportunity to view over thirty nest boxes using the camera. You could clearly see which nest boxes contained a heat source and which ones didn’t. Interesting! As expected the HSQ19 dealt brilliantly with larger mammals over a wide range of distance and in various habitats. Deer were clearly visible at distances over 300m. Conditions were VERY dark. There is no way I would have seen any of this wildlife without the HSQ19. I was impressed with the level of detail particularly when viewing foxes. You can clearly see the slight temperature difference between the body of the fox and its tail. 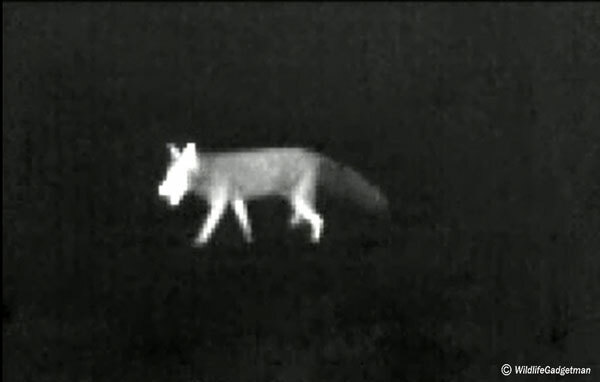 The second fox clip clearly demonstrates the impressive range of this thermal imager. 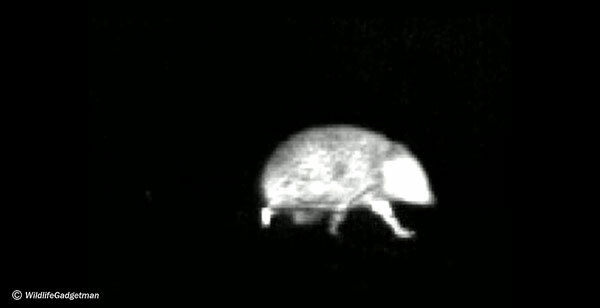 I was pleased to be able to capture some footage of hedgehogs too. These clips are interesting as, if you watch closely, you can see the ground glowing from the heat generated by the hedgehogs as they move away. So, does the the performance of the Pulsar Quantum HSQ19 justify the £2k+ price tag? Well, it depends. The build quality and performance without doubt is top notch. 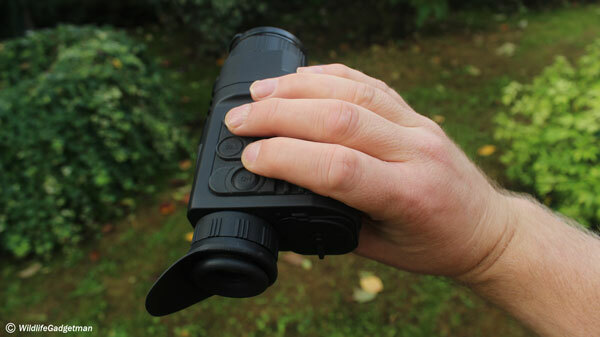 I can understand the £2k+ price tag but, after the initial novelty factor of looking at the heat signature of anything and everything how could you practically use the HSQ19 to help you watch wildlife? And the answer is….in lots of ways. As an enthusiastic wildlife watcher with deep pockets you could…. easily monitor nest boxes to see which ones are used for roosting and nesting without disturbing the birds. view the natural behaviour of wildlife in your garden or other location and see the precise routes they use to move in, out and around an area. monitor hedgehog boxes without opening them to see if they are in use. monitor the exact movements of wildlife in a location over a period to plan a photo or video shoot. easily monitor bird nest boxes at range to see if they are in use (nesting/roosting) without disturbing the birds or having to use ladders etc. A single person could monitor a large area in a fraction of the time. easily monitor Dormouse nest boxes at a distance to see if they are in use thus minimising disturbance. easily monitor bat roosts and boxes at range to see if they are in use. easily monitor mammal boxes at a distance minimising disturbance. monitor movement of wildlife in areas at distance minimising disturbance. Potentially witness wildlife behaviour new to science. Use as a tool to demonstrate behaviour and movement of wildlife to the public which they may not otherwise see. If you are interested in the potential of thermal imagers then visit the Scott Country website by clicking on the image below.